Where did our dignity go? It started when I was approached for a blog campaign to tout wearing no underpants. That’s right: going commando. The post was sponsored by a toilet paper company that wanted to tout the cleaning power of their product. No, I’m not kidding. The idea of blogging about this made me squirm. It was…not dignified, for one thing. But for another, it just wasn’t important enough for me to blog about. Not important to me or important to the world. I couldn’t imagine subjecting my readers to a post like this, no matter how much I was being paid. And the truth is, the idea of going commando sounds unsanitary to me. I saw lots of posts promoting this, mostly by younger bloggers, and then the campaign petered out. Thankfully. And then, not too long ago, I was offered an opportunity to tout a feminine product on my blog. It was a quality product by a company I respect. Under ordinary circumstances, I’d consider it. But this particular campaign required bloggers to come up with unique ways to use feminine pads and tampons. Like, perhaps, weaving them into jewelry. Or making an artificial flower arrangement with them. Or a cat toy. How about a monogrammed front door mat? If I saw my cat playing with a tampon? Oh, I can’t even imagine it. I mean, WHY? And who in their right mind would put out a front door mat made of sanitary pads? That’s right. No one. Not anyone mature, anyway. Now, I have to say that asking women to come up with clever alternative uses for feminine products may have sounded like a good idea in the marketing brainstorming meeting, but in my opinion it infantilizes women and disrespects their intelligence. The only reason bloggers are doing this is the money and the fact that they’ve lost sight of their dignity. Now, it’s no surprise to me that some bloggers have lost sight of their dignity: there are so few role models today. There are, however, so MANY role models for the opposite of dignity. Is Donald Trump dignified? Nancy Grace? Ann Coulter? Sarah Palin? How about the…K family? I won’t go on, but I could and so could you. So let me ask bloggers and writers: Would you want a serious editor to see that post? The one on which they assess the quality of your work? Here’s some writing advice: If you are a blogger asked to participate in one of these ridiculous campaigns, my advice to you is JUST SAY NO. Find a paying campaign that doesn’t make you out to be an idiot. One that you’d be proud to show an editor. 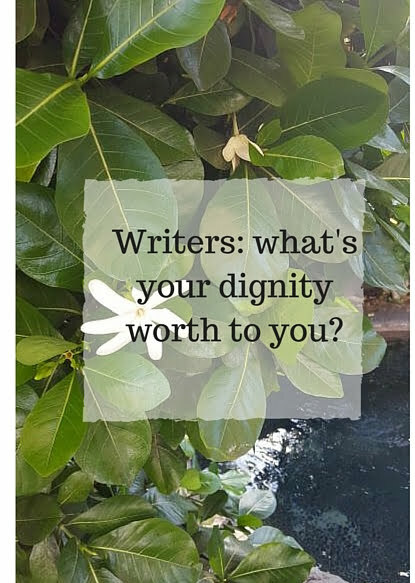 What’s your dignity worth to you? I think in our difficult financial and employment times, Carol, there has to be a little leeway on this. I agree about dignity. Of course. But sometimes there are other circumstances that go unseen and no one should judge another persons reasons for doing something they have to do. I hear you, I do. It’s not as much judging, it’s recommending a new look at one’s blogging strategy. The reason I don’t subscribe to “do what you have to do” is that could be a “reason” for drug dealing, prostitution and a raft of other things that we would not find acceptable. Or staying with an abusive husband. So many things. I think there is always another option. Making welcome mats out of tampons may not be criminal but it is a is a bridge too far in my opinion. Kudos to you for sharing that about the feminine product!!! I got the very same pitch—and was just joking about it with a friend yesterday—and was appalled. Absolutely ludicrous to have such a campaign. Worse yet that some folks will actually participate in it. I am pretty selective about what I blog about, but I also work full time so any extra money I make from my blog is a bonus. However if I really needed the cash I am sure I could come up with an awesome & creative way to write about anything. 🙂 I don’t let what other people choose to do with their blog bother me. I have to agree with Cathy. I have chosen to not write sponsored posts on my blog anymore, but I don’t expect it to generate income for me. For some, blogging is an important part of their family finances. I understand your point about dignity, but I have to say I have a lot of respect for people who can take a terrible product or topic and turn it into a good blog post. Carol, does this mean I need to toss out my Kotex welcome mat? It deterred unwanted solicitors. But, I agree with all the comments here. I applaud any writer who can turn a taboo product/subject into a well-written article. I absolutely agree, Carol. Perhaps like Cathy says, we may be in a more comfortable situation financially to do that. However, I think she missed your point about the fact that a blogger’s may not be considered for better opportunities if they sold themselves cheap. To each their own, I suppose, but… I’m with you. I’d be unwilling to compromise my own dignity for a few bucks. I recently saw John McEnroe touting a cream for foot fungus and I actually cringed. I’ts understandable being in survival mode and taking on topics that might be less than desirable…sort of like turning the castle into a bed and breakfast to pay the serfs, but draw the line…draw a real line of what you will and won’t do before you are asked. Decide to decide. I have counseled with lots of women who forget to pause….take a minute….before you do something you may not have to. Wait for a another way. I long ago dispelled the notion of “I had no choice”. We always have choices, but they are hard to see in the heat of a moment. Yes, my concern is that there is no consideration to dignity in our society today. Well, maybe not “none” but less than I wish there were. I just like anything you write that starts with the promise of an unpopular opinion by which you intend to stand. Never say never, but so far I haven’t ever been able to write about the intimate or private stuff I see others dive into. That said, I’m guessing if one is (oh what word to use here, how about bawdy?) enough to write about tampon chandeliers, they won’t be shocking many of their readers. My blog is my hobby so I use it to write the articles I want to write. It also showcases my work for publications that wish to hire me so I don’t tout products. I don’t blame anyone for trying but as we all know it’s very difficult to make money from a blog today! I couldn’t agree with you more about dignity. I maintain mine as often as I can although I have to say, in spite of the seriousness of your post — you are an excellent writer and just reading about maxi pad welcome mats and tampon chandeliers floored me. I was reading along wondering what type of crazy person would ask you to blog about that. And then it made me laugh. I immediately thought, OMG what’s next? A jock strap door knocker? I kinda agree- it’s bloggers that do posts for big name brands for no pay. Where is the dignity in that? I know how tempting it was when I first started blogging to do free work because I was impressed by the brand name, but it goes away. I don’t do anything unless it actually benefits me in some sort of way or I find it interesting. Oh this is more of a ‘hot topic’ than I expected. Truthfully, I don’t know where I stand. No one has ever asked me to blog for money, so there’s that. I guess I would just go with my gut and only blog about it if I thought it had some value. And there’s the rub…value can mean a lot of different things to different people. But if I feel like I’m granting a good service, not just making money, then I would consider it. I do, however, wish there were still just a bit of ‘shame’ and embarrassment left in the world. Cathy Sikorski recently posted…One Man’s Trash or When the Saints Go Marchin’ In…………. I TOTALLY agree with you. I understand that many people blog for money, but you have to draw the line somewhere. Feminine products?? Alternate uses??? Really??? There’s got to be other opportunities out there. Something else that gets me is their lack of respect for our time. They want (some of them–I’ve worked with some wonderful brands/PR agencies so don’t want to ditz all) us to get our posts up super fast. Latest to bug me is Grammarly. An entire post and they will donate TEN DOLLARS to charity. Offer a thou to my favorite charity and I’m your girl! Thank you all for your honesty. I think you may have opened a few eyes as to what many of us are really thinking when we are presented with these kinds of campaigns. As usual, the discussion here is amazing. I love you all for your willingness to speak out on all sides! Very witty treatment of the sad side of blogging – made me laugh! How about a nice hat made from feminine ‘products’? It’s just beyond belief what these marketing people come up with. I have never blogged for money. I prefer to keep what I write totally on my own terms. I wrote some utter rubbish in my career when I had to write advertorial stuff for newspapers and I am not proud of it. But I was younger then. Wouldn’t write about anything favourably now unless I would eat, drink, wear, drive, visit or buy it myself. Brilliant article – loved reading it. Gilly Maddison recently posted…Sibling Rivalry – Do You Have a Favourite Son Or Daughter? I totally agree with you. I have turned down good money – that I could really use – because I am appalled by some of these campaigns. Civility and any sense of dignity has literally gone down the toilet. I do understand the need to make money HOWEVER we have to pick a point, draw that line, and not cross it. I get a different kind of pitch — ones that are equally uncomfortable for me at least. Pitches come in from companies that make products that make brain claims: think better, improve memory, get that competitive advantage. They offer good money and some probably do work but I am not going there. And may I say, way to stir the pot my friend! Ok, now THERE’S a story worth telling! Oh yes, that is ABSOLUTELY a contender. Heartfelt. Sigh. I agree with you about dignity and honestly I’m not sure it’s something a lot of younger women think about. Personally I am choosy about what I write about on my blog and the content I provide for other blogs. I wasn’t approached about the alternate use for feminine products but if I was I would have written about the time I witnessed a life saved by a kotex pad. It was anot auto accident and the woman’s jugular vein was bleeding (I still have nightmares) and a passers-by stuffed a pad into her neck. They said she would have died within seconds if that didn’t happen. LIKE WHO SITS AROUND IN A ROOM AND THINKS USING FEMININE PRODUCTS CREATIVELY IS A GOOD IDEA?! SO glad you passed on that one. Great post, Carol! As a new blogger, it’s hard to find a balance between making money in honorable ways and staying true to your “brand.” I recently had a company reach out to me to do a paid review for the Otteroo swim device for kids (Google it) and I didn’t feel comfortable. I personally don’t like reading sponsored posts and don’t give them a lot of credence because I know the blogger is being paid to write a good review. It doesn’t interest me as a reader, and I try to write about things I’d actually want to read. Your post is a good reminder that bloggers need to consider the long-term impact publishing something silly can do for their professional reputations. And this doesn’t apply just to the blogosphere- it applies to school, work, and friendships. Cheers!